This free utility saves Outlook Master Category List to XML file. For ease of use, all categories in Microsoft Outlook are represented by a single list, which is called the Master Category List. You can edit it with Outlook, but there is no way to export or import the list. If you do not periodically make a backup copy of your Master Category List, you may lose the list completely when you reinstall the mail program or when it fails. In addition, you cannot migrate the Master Category List to another computer by using Outlook built-in features. When editing categories, you can manually list a text file or table, and then restore the master list of categories from this file manually. However, it is inconvenient, time-consuming and fraught with errors and mistakes. 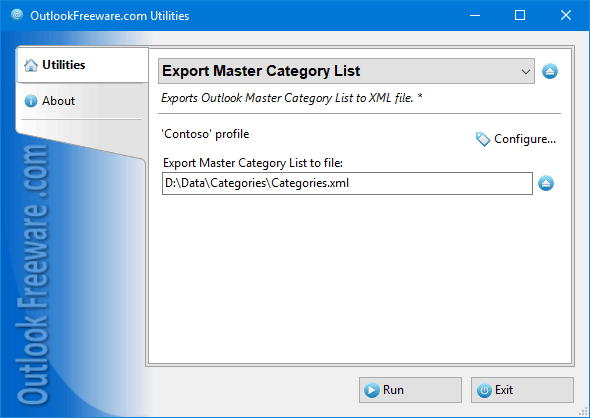 This free utility allows you to save categories from the Outlook Master Category List to a text file in XML format. After you save this file, you can edit it in any text editor, even Windows Notepad. This is useful when working with large category lists and allows you to add categories from other data sources or use the list in other programs. The utility will automatically detect the location of the Master Category List in the selected Outlook profile. To export or backup the Master Outlook Categories list, specify the desired XML file name on your disk or network share and run the utility. Set the option for saving category colors if you need them. After execution, you will see a report on how many categories were saved and from where. For automatic category list processing of multiple users, synchronization category lists between mailboxes and PST data files, and using the utility in your batch files and scripts, use the command line capabilities.